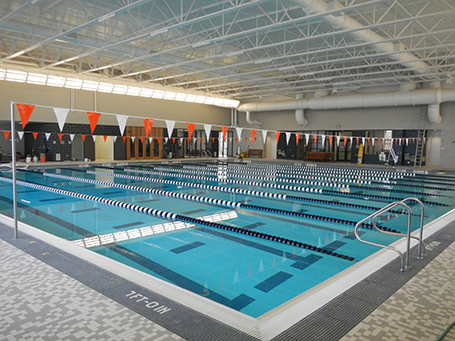 The North Grounds Recreation Center Expansion was the first of three planned projects to improve existing intramural recreational (“IM Rec”) facilities at the University of Virginia in Charlottesville. In the recently completed IM Rec Sports Project Planning and Formulation Study, it was determined that increased recreation, fitness, and wellness services for students and staff would address current unmet demand and accommodate projected future growth. Additional aquatics space was identified as the primary demand in the Formulation Study to be addressed, as well as increased social spaces in a location close to parking areas. The project included a new 30,000 sq. 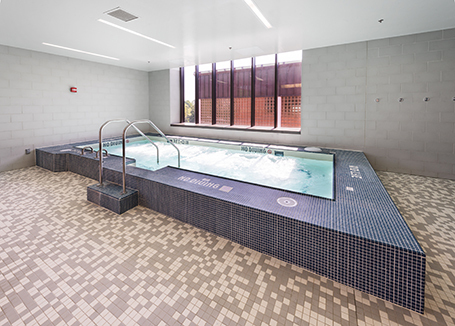 ft. addition with an aquatics facility consisting of a 25-yard by 25-meter pool, whirlpool spa, sauna, outdoor patio, a mind-body multipurpose fitness room, and two squash courts. Renovations of the existing facility included 7,000 sq. ft. of improvements to two racquetball courts, lobby, social gathering spaces, and the replacement of two squash courts. 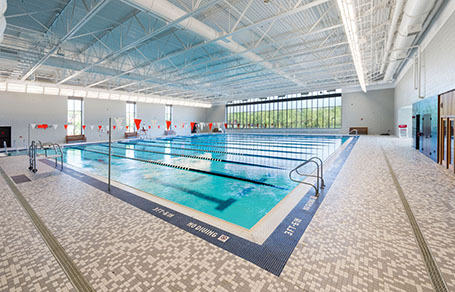 The North Grounds Recreation Center is pursuing the U.S. Green Building Council’s Leadership in Energy and Environmental Design (LEED) Silver certification for energy efficient design.